When you have a furry friend as part of the family, having a dog friendly neighbourhood is a must! After all, you’re going to be walking him/her around the block everyday. Here are some neighbourhoods you should look into! This neighbourhood is close to both High Park and the Waterfront. Walking along the trails on a sunny day will be very refreshing for both you and your buddy! Take advantage of vets and pet grooming stores nearby. There is also an off leash park nearby such as Sorauren Park. 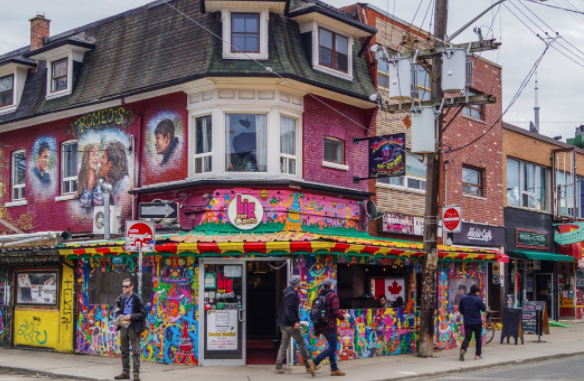 For busy downtown dog owners, walking around Kensington Market would be a fun way to spend your afternoon or weekend! Be sure to check out Café Novo where you can have your buddy with you at the patio. We recommend this area who own large buddies. You can walk or even jog along the waterfront with your buddy and enjoy some quality time together! Don’t miss Riverdale Park East and Riverdale Park West! There parks are a go-to hangout spot for social dogs and their owners. Even if you don’t live in this area, it’s worth spending an afternoon here with your buddy. How can we forget the Beaches from this list? Take your buddy to a nice dip in the ocean when it’s nice out! Did I mention that it’s oh-so-easy to get to downtown? You get to enjoy that city life too! Living in the city doesn’t mean your doggy has to compromise. Take a stroll in the Trinity-Bellwoods park and socialize with the other pups living in the big city! Have you been to Hair of the Dog? It’s a brunch place where you can take your buddy to the patio. Enjoy that nice well-deserved brunch!